I’ve tested a lot of chocolate cake recipes over the years, and this moist chocolate cake recipe is one of my favorites. It is incredibly moist, and turns out perfectly every time! I love this recipe for so many different reason. The first one is that this moist chocolate cake recipe doesn’t require a hand mixer, which means less dishes to clean!! It also comes together incredibly quickly. It’s a modified version of Robyn’s chocolate cake recipe on Add A Pinch. Another wonderful aspect of this recipe? It bakes pretty flat! If I’m just making a cake for family and friends, I’ll usually just use a bit of extra buttercream to level everything out. You can also trim the top of the cake with a serrated knife to make it perfectly level. If you’re still getting comfortable trimming your cake layers, here is a great tutorial on how to level and trim your cake layers. I love to add espresso to my chocolate cake recipes!! It pairs so well with the cocoa, and really elevates the chocolate flavor of the cake layers! If you’re not a fan of coffee, don’t worry! It isn’t a strong flavor in the cake, it simple enhances the overall flavor of the cake. Tip: Use Good Quality Baking Cocoa! To make sure these cake layers taste as delicious as possible, I highly recommend using a good quality cocoa. The quality of cocoa you use in this recipe is key, since it’s the main flavor of these cake layers! I love to use ghirardelli cocoa, because it gives the layers such a wonderful chocolate flavor. I love frosting this moist chocolate cake recipe with my chocolate or peanut butter buttercream, but the options are really limitless! Feel free to get creative, and make whatever combination floats your boat. Decorate as desired! The photo below shows a snickers cake made with this cake base, before it was crumb coated. If you try this recipe, please tag me @chelsweets, and use the #chelsweets, so I can see your beautiful creations!! This chocolate cake recipe comes together so quickly, and is incredibly moist! It's just as delicious as it is easy to make. Preheat oven to 350 degrees Fahrenheit. Line and grease three, eight-inch cake pans, or four, eight-inch pans. Combine the dry ingredients (flour, sugar, cocoa powder, salt, baking soda and baking powder) in a large bowl. Whisk together until combined. In a separate, medium-sized bowl, add the instant espresso or coffee into the hot water, and stir until dissolved. Add in the buttermilk, oil, and vanilla into the instant espresso mixture. Give the mixture a quick stir to combine the ingredients. Pour the wet ingredients into the dry ingredients. Mix by hand until fully incorporated. The batter will be on the thin side, but that’s the consistency you're after! Divide the batter evenly between the cake pans, and bake for about 24-27 minutes. Remove from oven, and let the cakes sit for about 5 minutes. Gently run an offset spatula around the rim of the cake pans to loosen them. Place the cake pans in the freezer to speed up the cooling process, and to trap in additional moisture. Mix in the cooled, melted chocolate chips. These cake layers and buttercream can be made in advance!! I highly recommend making them ahead of time to make the decoration of the cake less stressful and more fun. These layers bake quite flat! However, if you want them to be perfectly level, I recommend trimming the tops with a serrated knife once they layers are completed cooled. I like to chill my cake layers in the freezer for about 20 minutes before frosting and assembling my cakes, to make them easier to stack and frost. I’ve been trying to find the perfect chocolate cake recipe. This is it! Researching is done. It’s so moist, chocolaty, and bakes evenly. Thank you! What brand of espresso powder do you use? Just wondering about the coffee or espresso… is it going to taste like coffee or how does it help the chocolate cake? I think it gives the cake flavor a lot more depth! it mostly just enhances the chocolate taste. However, if you don’t like coffee you can leave it out! And can it be replaced by regular coffee? I made this cake, and omg it was delicious everyone loved it. I used regular coffee. Thanks for sharing your recipes Chelsweets! Hi there! I love your cakes, I’ve made a lot of your recipes and they’ve all turned out nicely. However, every time I make this cake it doesn’t dome it sinks in the middle. Do you have any insight by chance? Strange! Maybe you can try cooking it slightly longer! Hey girl! So is it okay if I use coffee instead of espresso? If I have 2 pans to fill that are 10 inches each. How long would I need to bake them for? Also you mention putting the cakes in the freezer, how long should they be in for? I’m not sure, I haven’t baked this recipe in 10 inch pans before! I just freeze them until they’re fully chilled, or if i make them in advance and freeze them overnight, i let them thaw for about 20 minutes before I start decorating! I just pulled mine out of the oven and oh man does it smell amazing! Can’t wait for it to cool and decorate! I am doing this with your vanilla buttercream (with chopped fresh strawberries mixed into the buttercream going in the layers), ganache drop and decorated with chocolate dipped strawberries on top. Do you have any advice for the strawberries I am mixing into the middle layers? I have heard before it can get too watery… have you found that to be true? I’d rest them on paper towels to absorb a bit of the extra juice! sometimes it can get too juicy and it gets hard to stack and frost the layers! can you layer the cake pans with parchment paper? I have seen you pull off paper from your cakes just before you assemble them. And as for the snickers cake what flavor buttercream did you use? Yes! I line my pans with parchment rounds that I cut out. I have made a ton of different snickers cakes, but usually use a peanut butter or caramel buttercream, or both! The receipt for caramel buttercream under the snickers cake says butter AND peanut butter. Is that correct? I don’t see a mention of it in the instructions and wanted to make sure that was correct. Your cakes always look amazing! Hi, i just made thus reciepe today and followed it to the dot and it tasted like a sugar free diet cake. Any recommendations why that happened? If I were to leave out the espresso, would I replace that with hot water? yah or you can just add a bit more milk/buttermilk! 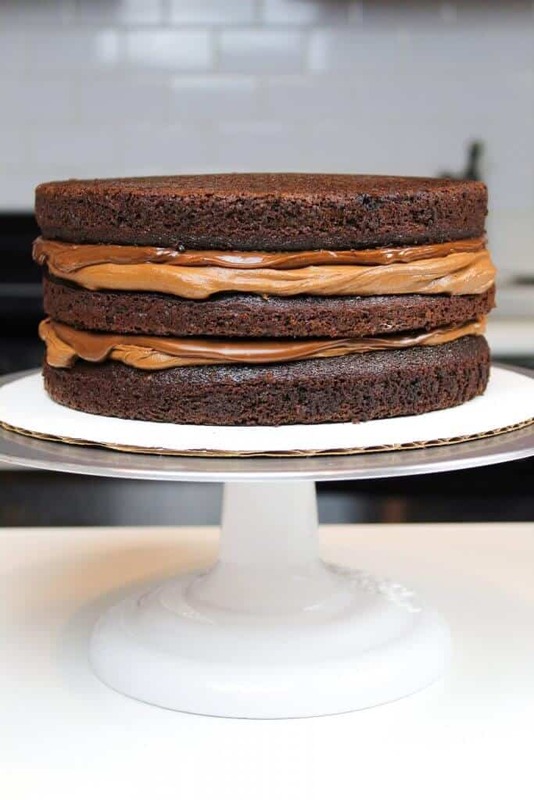 Beside so some of the ingredients, what is the difference between this recipe and the chocolate layer cake recipe? Do you recommend one over the other? the texture is much different between the two! I like the taste of this one better, but it’s a but it doesn’t bake level and it’s as sturdy to stack! It’s much easier to decorate with the chocolate layer cake recipe!! Your vanilla layer cake is my go-to (YUM!!!!) and I want to try this. Have you heard from anyone whether or not this one holds up well under fondant? Thanks in advance! i have not! but I think as long as your frosting is sturdy enough, it should! Hi! Question: Have you tried using the milk/vinegar combination as replacement for the buttermilk? I was wondering if the texture was still the same. Making your chocolate cake + chocolate buttercream for Mother’s Day! I haven’t, but it should yield a very similar result! you can omit it if you’d like! Hi, Just another amazing recipe from you as always, do you have a small batch recipe for this cake like you have for the vanilla layer cake, if so can you please post it. would love to have this for a 6 inch layered cake. Thank You !!!! i don’t yet, but it’s coming!! stay tuned 🙂 and thank you! I usually use either hershey’s cocoa powder, or wincrest black cocoa! hi girl! i love your recipes but I do have a question, my oven is not that good (doesn’t have a grill) so my cakes always tend to be cooked edges and very uncooked to the center. i’ve tried baking them for longer but the edges end up being very dry ? 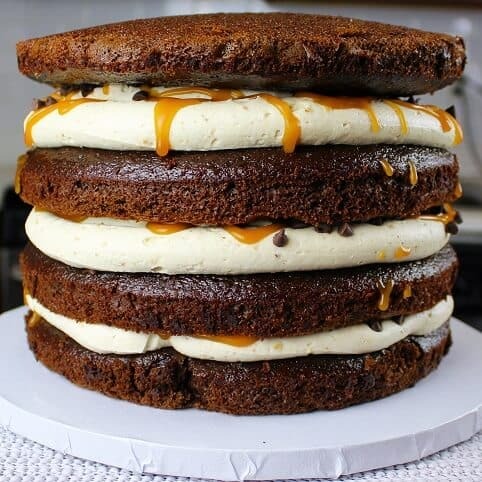 ?would you suggest to make this recipe and let it bake for longer or the go-to chocolate layer cake for a cake that i’d like to decorate? oh geeze! that sounds like a struggle!! I’d recommend trying to bake this longer, and if it gets try, maybe you can add some simple syrup to it to moisten it! Hey Chelsea! I tried making this recipe with an 8-inch and 6-inch pan and cooking it longer. It ended up falling in the middle of the cake. Any ideas as to why? Sounds like you need to make it slightly longer!! Can I do this in two round pans, or should I cut the recipe in half? I’m planning just a two-layer cake, but I feel like I usually do 2 cups of flour for most recipes that I do 2-9″ cakes. I’d recommend cutting the recipe in half! if you make it in a 9 inch pan they’ll be pretty thin though! I’d say a half batch will make 2 7 or 8 inch cake layers! Do you use iodized table salt or sea salt in your recipes? I use iodized table salt! Sorry if I’m being really dense but is it granulated sugar or caster sugar? Thanks! Would I be able to use this recipe for cupcakes? Thank you so much for sharing your recipes and tips! And I just love your YouTube channel!!! I can’t wait to make this chocolate cake! I love this chocolate cake recipe! So moist and yum? I made it for my son’s birthday and it turned out so well! Thanks, Chelsea! And happy new year in advance ? 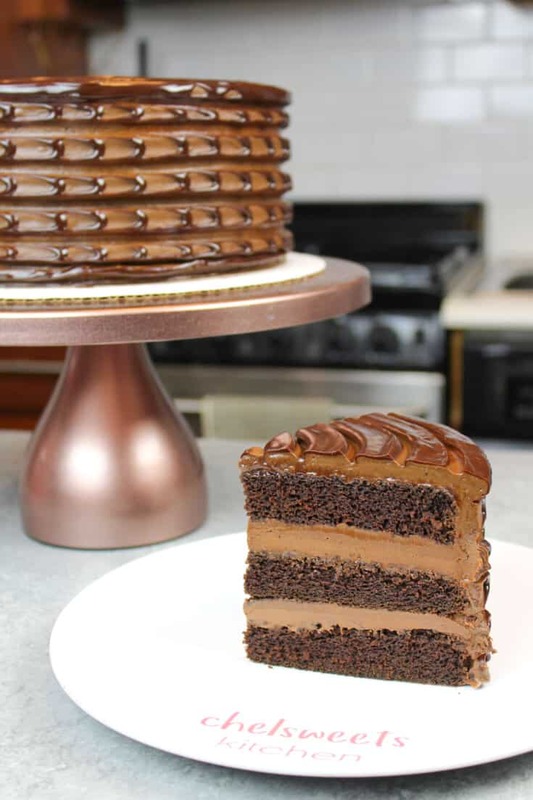 I want to make my dad the perfect chocolate cake for his going away party and he is very picky when it comes to cake, it has to be moist so this one sounds perfect but he hates coffee so I am wondering if the espresso in the recipes is tasted? I’m thinking this would be a great chocolate cake I need to make in the next few weeks. A few questions, what does the vinegar do? Would it hurt to omit it? Would I double or make one and a half recipes for a half sheet cake? Wondering about the baking time as well. I’m thinking maybe start checking for doneness at about 35 minutes. Your thoughts on all these questions would be great!!! it just adds to the flavor a bit! you can omit it if you really want. How big of a half sheet cake do you want to make? I think batch should be enough to make two 9×13 inch sheet pans! Use flower nails to help the layers bake more quickly and evenly, and they should bake for about 35 minutes! How would you adjust this recipe for high altitude (we are a mile high)?